Principal UK supplier of live snails and 1st snail sommelier. When the weather is hot please accept that it may be unwise to send out live snails. A mother and daughter farm based in rural East Kent, the Garden of England. We specialise in selling succulent live edible snails that live outdoors on our vegetable plot in the summer feasting on fresh vegetables and fruit. Snails have been part of our diet for thousands of years and came to Britain with the Romans. They don't store fat and remain a cheap nutritious source of protein, minerals and vitamins for people all over the world. Look at our recipe page to find out how to cook snails using local cider. Lots of people grow their own food. You can grow your own escargots too. We run courses for people who want to grow their own escargots and learn how to cook them. Ask for details of our one day courses on snail farming. The place to buy succulent escargots for the dinner table, smallholder supplies, reptile food and fabulous gifts for all the family. Do you enjoy eating fresh succulent escargots? Want to serve snails to your dinner party guests? Take a look at our tasty recipes to inspire you. Our book about setting up and running this snail farm in rural East Kent is now available online and through all good bookshops. Find out what we've been doing at the snail farm. Slow Summer Snail Farm is busy growing snails for another good season on our vegetable plot in rural East Kent, the garden of England. Find out what we're doing, how the snails are growing and where you can see us. Read about day to day life on the snail farm. Our snails are available for educational visits to schools, brownie and scout packs, pre-schools and other groups or clubs. One day courses on snail farming. See our farm in action both indoors and outdoors. We use a mixed farming system like the rest of Northern Europe. The breeders and babies are indoors when it's too cold outside and the youngsters grow through summer on a vegetable plot outdoors. We have been trading SINCE 2006, supplying the uk AND EUROPE with SUCCULENT live snails perfect for cooking. We sell escargots direct to the public as well as to restaurants. We promote ‘Grow Your Own food’ and the outdoor lifestyle. 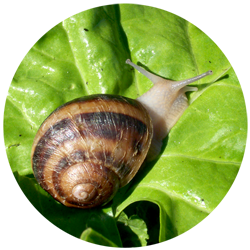 We are the UK principal supplier of live edible snails. We are the only Trading Standards registered animal feed manufacturer in the UK selling our own complete nutritious snail food. We are keen to engage children in learning about living things and supply Mini Snail Farms to schools and nurseries as well as to universities engaged in research. 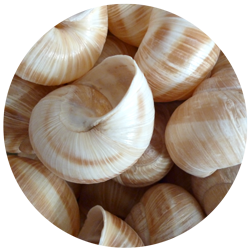 We stock live snails Helix aspersa maxima ('gros gris') and Helix aspersa muller ('petit gris') for both private customers and chefs who want to buy live snails to cook. People come to us who want to grow their own snails, come on courses and buy breeders, books, hatched eggs and snail food. We have a group of regular customers who keep reptiles, both zoos and private customers who keep reptiles as pets. We're involved in a conservation project with RSPB supplying tiny snails to feed baby birds. Our snails have 'strutted their stuff' across your TV screen many times through our loan scheme to film companies. You may also have seen us in Taste of Kent, Great British Menu, Alan Titchmarsh Show, Countryfile, Easter Eggs Live or CBBC Incredible Edibles and the BBC Good Food Show. Helen Howard has published her first book about farming snails: Molluscs and Me and gives talks to community groups to promote snail farming in the UK. Helix aspersa maxima and Helix aspersa muller do well in the mild damp English climate, growing faster and getting bigger than their cousin, the common garden snail. In winter the snails need to be protected from frosts and our adult snails go into hibernation. In the summer they go out of doors onto our vegetable plot when the weather is warm enough. In summer, the snails are protected by an enclosure which keeps out the predators that might eat them: birds, shrews, foxes, rats and badgers and hedgehogs to name just a few.